Hospitals and long-term care facilities can be breeding grounds for dangerous microbes. In the past few years, antimicrobial-resistant strains of bacteria and viruses have become prevalent in healthcare spaces. Healthcare-Associated Infections (HAIs) can be acquired by patients during their treatment in healthcare centers. While completely preventable, these infections lead to unnecessary suffering and severe decreases in patient satisfaction and quality-of-treatment. 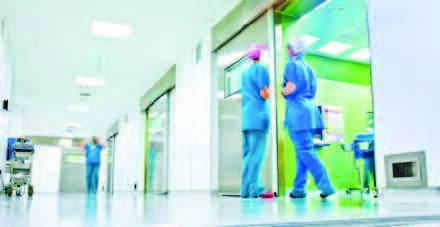 Hospitals and care centers experiencing increased levels of Healthcare-Associated Infections create a dangerous patient environment and can face exorbitant costs and legal action. Let SMT’s ultra-pure chlorine dioxide products help protect your healthcare space. Our products are effective against a wide range of human health pathogens, including bacteria, viruses, and fungi. Our products are EPA-registered for hospital-grade disinfection. SMT chlorine dioxide eliminates pathogens at point-of-use. For example, Selectrocide destroys 99.999% (5-log reduction) of Staphylococcus aureus in 60 seconds. Our ultra-pure chlorine dioxide eradicates dangerous microbes to create an ideal patient environment for a healthy recovery. Healthcare professionals understand the significance of proper disinfection techniques. Pure chlorine dioxide exists as a gas in its natural state and is highly soluble in water. Also it presents a non-corrosive, easy-to-use and more effective alternative than chlorine bleach. Working at fractional concentrations when compared to chlorine bleach, pure chlorine dioxide is able to simply kill more pathogens with less disinfection concentration. This phenomenon provides a safer, non-corrosive alternative for surface disinfection in health-care facilities.